Th London Bridge runs over the Thames river Thames. It connects Southwark and the London city in central London. It is located between Tower Bridge and the Cannon Street Railway Bridge.The Pool of London's western end is formed by it.London Bridge station and Southwark Cathedral are situated to the south of the London bridge and the Monument tube station and the Monument to the Great Fire of London are situated to its North. 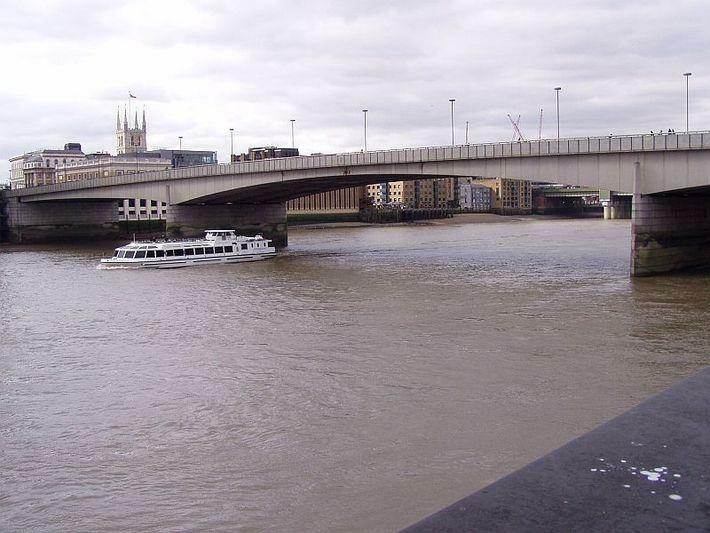 Until 1729, the London Bridge was the only bridge which ran over the downstream of the Thames from Kingston until the Putney Bridge opened. On 17th March 1973, the current bridge opened and it is the latest in a succession of bridges to occupy the spot and claim the name. A small segment of the A3 road runs over the London Bridge. The Greater London Authority maintains it. Bridge House Estates maintains and owns the bridge itself. It is an independent charity. On the south side of the area between Tower Bridge and London Bridge lied BID (Business improvement District). It is maintained by the London bridge. Where is London Bridge located ? Open all day free of cost. Tube station - "London Bridge Tube Station"
Rail Station - "London Bridge Rail Station"
London Bridge is falling down,Falling down, falling down.London Bridge is falling down,My fair lady! Build it up with iron bars,Iron bars, iron bars.Build it up with iron bars,My fair lady! Iron bars will bend and break,Bend and break, bend and break.Iron bars will bend and break,My fair lady! Build it up with needles and pins,Needles and pins, needles and pins.Build it up with needles and pins,My fair lady! Pins and needles rust and bend,Rust and bend, rust and bend.Pins and needles rust and bend,My fair lady! Build it up with penny loaves,Penny loaves, penny loaves.Build it up with penny loaves,My fair lady! Penny loaves will tumble down,Tumble down, tumble down.Penny loaves will tumble down,My fair lady! Build it up with silver and gold,Silver and gold, silver and gold.Build it up with silver and gold,My fair lady! Gold and silver I've not got,I've not got, I've not got.Gold and silver I've not got,My fair lady! Here's a prisoner I have got,I have got, I have got.Here's a prisoner I have got,My fair lady! What's the prisoner done to you,Done to you, done to you?What's the prisoner done to you,My fair lady! Stole my watch and broke my chain,Broke my chain, broke my chain.Stole my watch and broke my chain,My fair lady! What'll you take to set him free,Set him free, set him free?What'll you take to set him free,My fair lady! One hundred pounds will set him free,Set him free, set him free.One hundred pounds will set him free,My fair lady! One hundred pounds we have not got,Have not got, have not got.One hundred pounds we have not got,My fair lady! Then off to prison he must go,He must go, he must go.Then off to prison he must go,My fair lady!